Contemporary playwright David Mamet's thought-provoking plays and screenplays such as Wag the Dog, Glengarry Glen Ross (for which he won the Pulitzer Prize), and Oleanna have enjoyed popular and critical success in the past two decades. Among the most prolific and provocative of writers, Mamet frequently draws emotional responses from both audiences and critics. Mamet in Conversation collects interviews with the playwright that offer readers insight into his life in the theater, his artistic vision, and the evolution of his craft. The interviews help followers of his work better understand the sensibilities that have informed his work in drama, film, and prose over a twenty-five-year career. 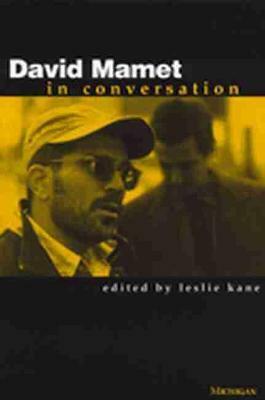 The conversations collected here--several of which appear in print for the first time--allow a glimpse inside Mamet's creative process, and to the recurring motifs that drive his work. The range of topics is impressive and includes the celebratory purpose of theater, the responsibility of the playwright, writing for Hollywood, the seduction of fame, the search for truth and the merchandising of it, and the decay of culture. The interviews shed light on the personal as well: Mamet's return to Judaism, his appreciation of Midwestern virtues, his love of rural Vermont, the problems of embattled virtue, and the challenge of aging. The book includes transcripts of Mamet's engagingly candid broadcast interviews with Jim Lehrer and Charlie Rose of PBS, published here for the first time. Leslie Kane is Professor of English, Westfield State College. She is the author of three previous books and is President of the David Mamet Society of the Modern Language Association.